Home Joy & Laughter Change Your Mind. Change Your World. I have people in my life who are perpetually miserable. They are in constant complaint about life. Personally, I don’t like feeling negative and complainatory. I’m not one of those people that enjoys wallowing in misery. If you, too don’t like feeling negative, then don’t. If you can’t immediately change the circumstances that are leading to your negative feelings, use that big brain bestowed upon you to change your thoughts and feelings. Believe it or not, you DO have control over those things. Happiness and joy begin in the mind. Once your thoughts and feelings change, your world will follow. 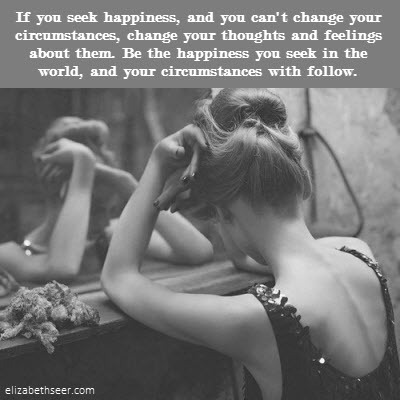 be happy, change your life, change your mind change your world, change your thoughts, happiness begins in the mind. Bookmark.